Last year in the 25 days leading up to Christmas I doled out one blog post a day detailing my favorite Christmas songs. 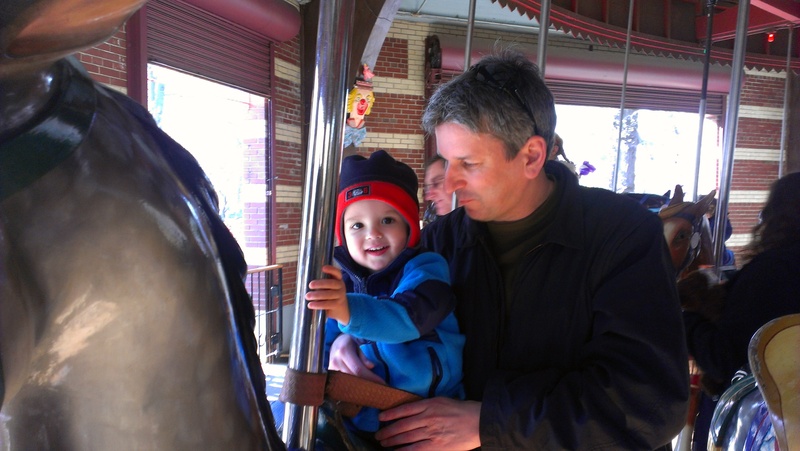 I thought about doing that again this year. However, I realized that I although I could certainly come up with another list of 25 songs to post, last year I really exhausted my absolute favorites and the ones I actually had something to write about. Thus, I decided this years 25 Days of Christmas needed a new theme. After thinking about what that might be I settled on my favorite Christmas movies. This isn’t to say I won’t throw in a few bonus Christmas songs here and there or other Christmas related posts, but the actual daily posts will focus on movies. All of the movies that I’m going to write about either are actual Christmas movies about Christmas related things like Santa or movies that remind of Christmas for some reason or another. I can already tell you a couple of movies that will not be appearing on my list that many of you will find horrifying. There will be no Christmas Story. I can’t stand that movie. I have never understood why everyone loves it so much. I just find it annoying. I will also not be including Scrooged, perhaps because I was too young to appreciate it as a small child when I first saw it and never got over that. Finally, there will be no Love Actually. Based on my small slice of the internet it seems like I am the only one who does not consider this to be their go-to Christmas movie these days. I saw it once when it first came out. Thought it was so-so and never thought of it again until a few years ago when social media informed me that everyone else adores it beyond belief. I thought about rewatching it just to see if there was something that I missed, but then there was a lengthy discussion of it on NPR’s Pop Culture Happy Hour podcast this past week. Listening to that I realized I definitely remembered enough about the movie and it actually made me decide that I didn’t need to see it again. I’m just not as super excited about it as everyone else. I cannot in any way guarantee the quality of the movies I will be writing about. Many of them are nostalgic favorites from my childhood. Some of them I haven’t even seen since I was a kid and my feelings about the ones I have seen as an adult are forever influenced by my childhood memories. Perhaps if I had seen some of them for the first time now I would be singing a different song. At any rate I hope you’ll indulge my trip down memory lane. Feel free to share your own favorites or try and convince me why I’m wrong about Love Actually. While we were in New York City we took in a Broadway show, which I am wont to do when we are up there. This time it was Once, which is based on the 2006 film of the same name. Once had pretty much been at the top of my list of shows to see since I heard it was being workshopped. My excitement only grew the more I heard about it. It also won 8 Tony’s including Best Actor, Best Musical, and Best Book. I would have seen it the last time we were in New York except that I wanted to make sure to see Peter and the Starcatcher while Christian Borle was still playing Black Stache, so that won out instead. Thus, Once was at the top of my list for this trip. The movie stars Glen Hansard and Marketa Irglova, who wrote the songs, one of which won an Oscar. It’s a bittersweet story of music, love, and loss. Glen Hansard plays an Irish street musician down on his luck, while Marketa Irglova plays a young Czech girl who befriends and inspires him. They begin playing music together and work to a demo recorded in order to help Glen’s character pursue his music career. If you haven’t seen the film you should. Then after that you should watch the documentary The Swell Season, which follows Glen and Marketa as they tour as the Swell Season, which they did following the movie until recently. Now it appears they are both playing solo for now. I was curious how they were going to effectively translate the small and understated but beautiful film into a Broadway musical given that they tend to involve a lot of grand music and dance numbers, but they did a wonderful job. The show is different from any other musical I have ever seen because it is so much more understated. This is the largest musical number in the show as performed during the Tony’s last year and as you can see it pales in comparison to what you would see in most musicals. The story in the movie and the musical are very similar though there are some changes. The musical is written in a much more humorous fashion than the movie was, some of the plot is left out of the musical, and I guess to make it more palatable to an American audience they changed the fact that the guy was trying to get to London to New York instead. Unlike most musicals where the characters burst into song to express what they’re saying most of the music in Once is sung as if the characters are actually performing the songs either in a bar, for each other, singing to themselves, or in the recording studio. Most of the dancing comes during the scene changes, which is effective. There are a couple of musical numbers they try to add some artsy dancing to, which I actually found distracting. I get why they did it because of people’s expectations for a Broadway musical, but I kind of wish they had left most of it out. That was very minimal though, so it’s not like it ruined the show for me or anything. There are a couple of clever things about the show that I really liked. The set for the show is a bar, and prior to the show and during intermission you can actually go up and order drinks from the bar. Prior to the show members from the cast come out and play a bunch of music on stage as if they’re just hanging around a bar playing music, which then pretty much leads directly into the show. There is no sharp distinction from that and the start of the show except that the lights go down. The other thing they did does pertain to a minor spoiler so stop reading now if you don’t want to know anything about the show. There are a number of characters who are supposed to be speaking to each other in Czech at several points during the show. They had a sort of reverse subtitle thing going during the show with the actors actually speaking in English, but an LED scroll above the bar displaying the actual Czech. For most of the show I was thinking that’s kind of interesting, but whatever. That is until the real reason for that display came into play. Near the end of the show the Guy character (currently played by Tony winning Steve Kazee) and the Girl character (currently played by Tony nominated Cristin Milioti) asks her if she is still in love with her husband. She answers him in Czech, which he doesn’t understand saying “I Love You”. In this case, the actress speaks the Czech and it is the English translation that is displayed on the scroll so that the audience knows what she said even though the guy doesn’t. I thought it was a genius bit of staging. If you get the chance I would definitely recommend it. It’s obviously still playing on Broadway and I don’t think there’s a closing date set yet, so you should have some time to see it there though I don’t know how much longer the original cast members are signed on for. The show is also going to go on tour starting in the summer of 2013, so you can look for it in a theatre near you next year as well. As this posts I will be on a bus to New York City to visit my husband’s sister, her husband, and their twins for Thanksgiving. I’ve been trying to figure out how to write about being thankful, but have started and then deleted what I had written multiple times. It’s not that I don’t have more things to be thankful for than I can count, but that everything I wrote wasn’t adequately expressing what I wanted to get across. This what I managed to come up with. I am thankful for so many things that are a result of me just being born who I am and where I was. I am thankful that unlike many people across this world that I will not have to worry about deadly attacks occurring where I live. Right now the focus is what is going on in Gaza, and as I continue to see and hear about what is going on over there I am thankful I was born in a nation that despite our differences is mostly peaceful. There many places across this world where that peace does not exist. I am thankful that I was born to a well off white family and because of that have been blessed with many things that directly stem from the station in life in which I was born. I have never had to struggle against racism. I have never had to worry about where my next meal is going to come from. 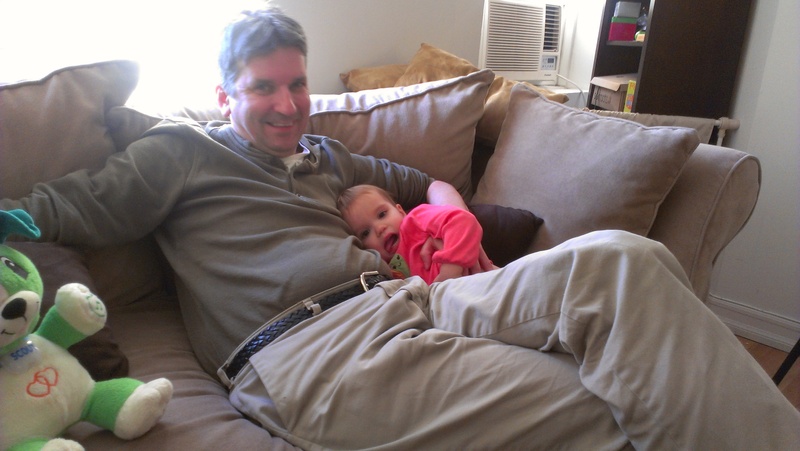 Living in Baltimore I am constantly bombarded with tragic stories of violence. I have never had to worry about living in a place that wasn’t safe either because of violence or poor living conditions. I have never had to worry about receiving a subpar education. I have never had to worry that if tragedy struck me because of something like a lost job that there wouldn’t be anyone there to help me out until I could get back on my feet. I am grateful that as a woman I was born in a time and place that does not relegate me to the status of a second class citizen. I have had the privilege of being well educated. I can hold a job. I can speak my mind. I can vote. I can marry who I want. I can choose to not have children. There are many places in the world that none of these things are true. I am thankful that I have these opportunities. I am thankful that I am free to practice my faith without persecution and that those around me are also allowed this freedom. I don’t have to worry about being tortured or killed for following my beliefs. I don’t have to follow religious rules being imposed on me whether or not I agree with them. I am grateful that I am lucky enough to have a job that provides me with good healthcare that allows me to afford to properly treat the chronic illnesses I have and cover me for any other medical issues that may occur in my life. If for some reason I were to ever lose my job and my medical insurance along with it, I am also lucky to have a husband whose insurance would cover me. I don’t have to choose between paying for my healthcare and paying for other expenses. I don’t have to let medical conditions deteriorate sometimes to the point of death because I can’t afford to treat them. I can afford to see the doctors I want and to receive the treatment I want because I happen to get health insurance from my employer. There are many people in this country who do not receive that luxury. I am thankful for all of these privileges I have in my life that are mostly a result of me being born who I was rather than anything I did to deserve them. There are many people across the United States and the world who do not share these same privileges even though I think they should. 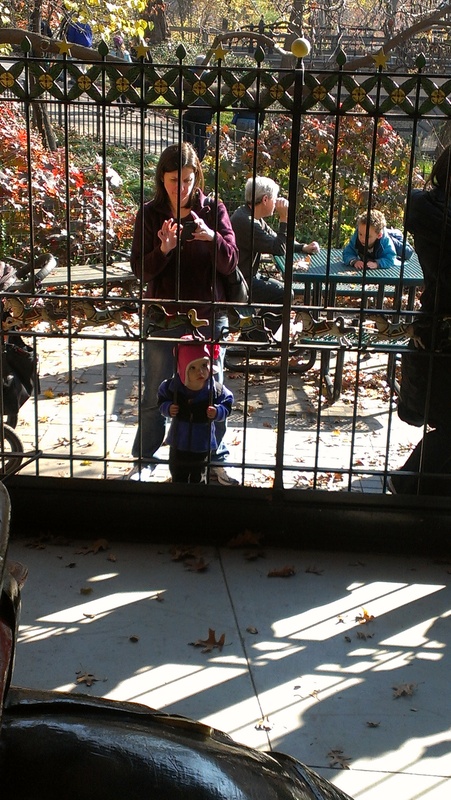 Hopefully instead of just being thankful for what I have I can work to make sure that others have these same freedoms. I’ve been thinking recently about how the way I listen to music now is much different than the way I have listened to music in the past. It’s both a function of how the digital age has changed the way in which I access music as well as changes in when and how I consume music. When reading the music reviews from the fabulous Mark Blankenship, I notice he often refers to the lyrics of the songs he’s writing about, which made me realize that I rarely pay attention in any real way to the lyrics of the songs I listen to anymore. That was not always the case. I used to be one of those people who came home with my cassettes (yes I’m old) or CDs, pulled out the liner notes and listened to the whole album through several times while singing along. Thus I knew a lot of lyrics to songs and really paid attention to them. I remember a certain point in time where my friend and I would make each subject line on an email to each other the lyric from a song that expressed whatever was about to be said in the email. There is no way I could do that now at least not with any music from the past decade. Both the lyrics and the music in a song used to be equally important to me when falling in love with a song. Now when I fall in love with song it’s almost always based on the music alone. I still buy a surprising number of albums in this digital age, but they of course don’t come with liner notes. I am a very visual person when it comes to words so without having the lyrics in front of me to actually see them, I don’t tend to internalize them. Even if I had the liner notes, I still don’t think I would be able to spend that much time pouring over the lyrics. Now that I’m married I rarely have alone time in my house, and just don’t have the time to sit around listening to an album while not also being engaged in some other activity. This of course distracts from concentrating on the lyrics. For the most part I do most of my music listening while I’m at work, and there I am obviously doing other stuff so I’m not paying attention to the lyrics but do pick up on the music in a song. I still obviously love going to concerts, but I am sadly no longer one of those people who can sing along with all the songs because I no longer know the lyrics. I just no longer listen to music the way I once did. Sometimes I miss it, but I now value songs in a much different way than I once did. It’s not a bad thing, but just something I was thinking about and felt like sharing. 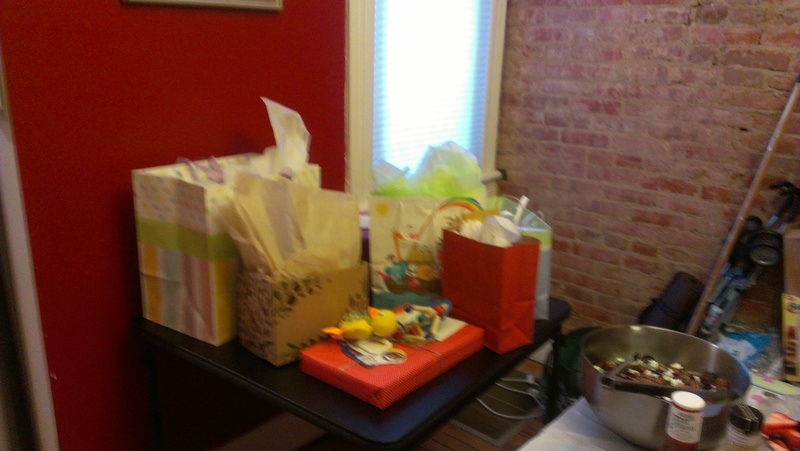 Yesterday my friends Alison, Darra, and I hosted a baby shower for our other friend Tracie at my house. We went with a baby block theme, which should be pretty apparent in a minute. 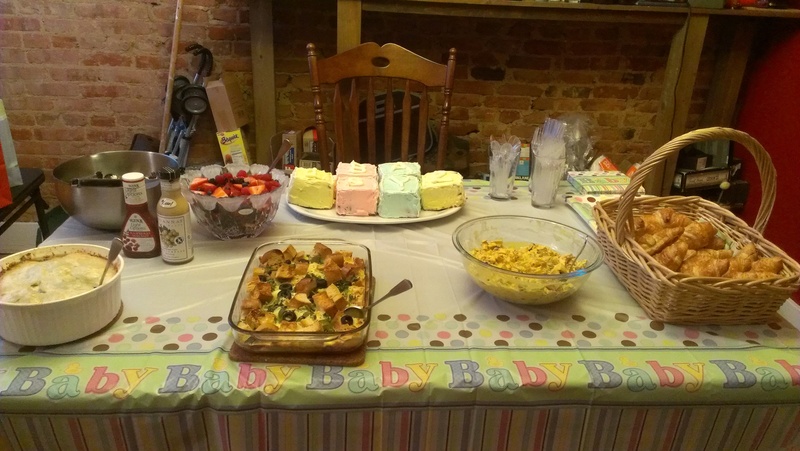 After I decided on the theme, I of course wanted to decorate the cake with baby blocks somehow. 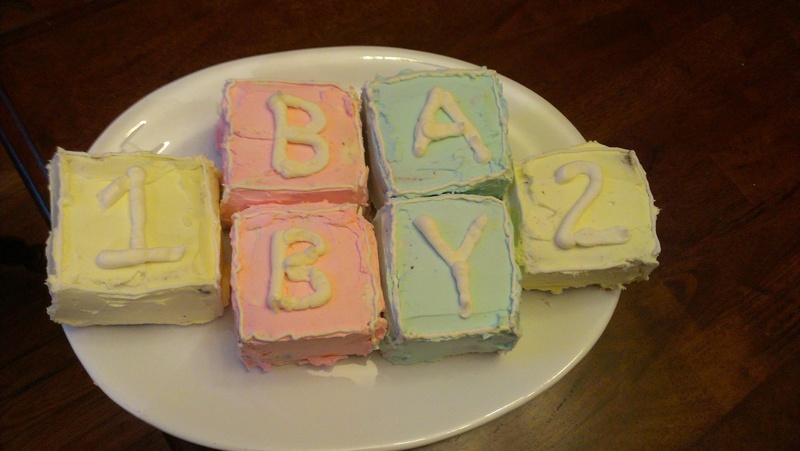 While searching for baby block cake decorating ideas, I instead stumbled upon the idea of making the cake itself into baby blocks. I’ll go into more details about the cake later for anyone who is interested in how I made it. It certainly wasn’t perfect and if I were a professional baker would probably wind up on something like Cake Wrecks, but I was definitely pleased with the way it turned out. The rest of the menu was brunch type food: potato, acorn squash, and goat cheese gratin, a Mediterranean strata, curried chicken salad with croissants, berry salad, and regular salad. We also provided coffee, orange juice, and hot spiced apple cider to drink. Party City didn’t have any baby block themed shower stuff. They also had very few choices that weren’t gender specific. Since the mommy-to-be isn’t finding out whether she’s having a boy or girl, I picked the best gender neutral set of decorations they had. You can kind of see the garland thing strung above Darra’s head. My cats were fascinated by it hanging up there and kept trying to figure out how to get to it, so I was super disappointed when they had zero interest in actually playing with it after I took it down and offered it to them. 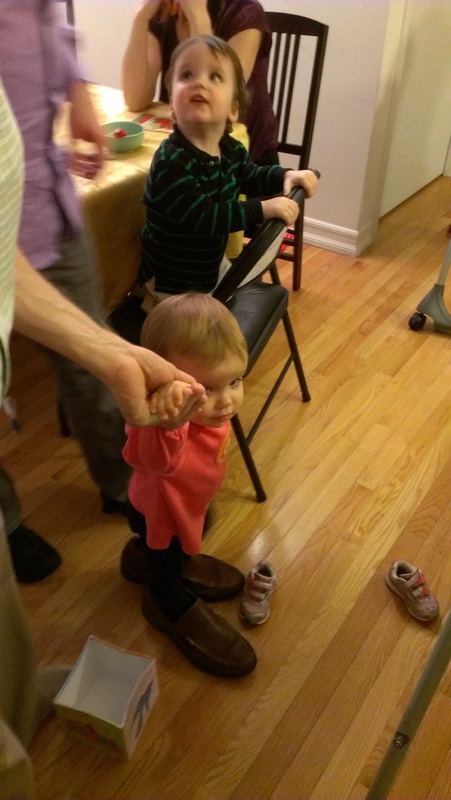 After enjoying the spread of food we played Baby Song Name that Tune. I clipped short segments of songs (about 10 sec) from songs that had the word baby in the title. There were 20 songs and people got 1 point for the song title and one point for the artist. I sometimes forget that most of my friends are not into music nearly as much as I am, so people struggled through the game more than I thought they would. 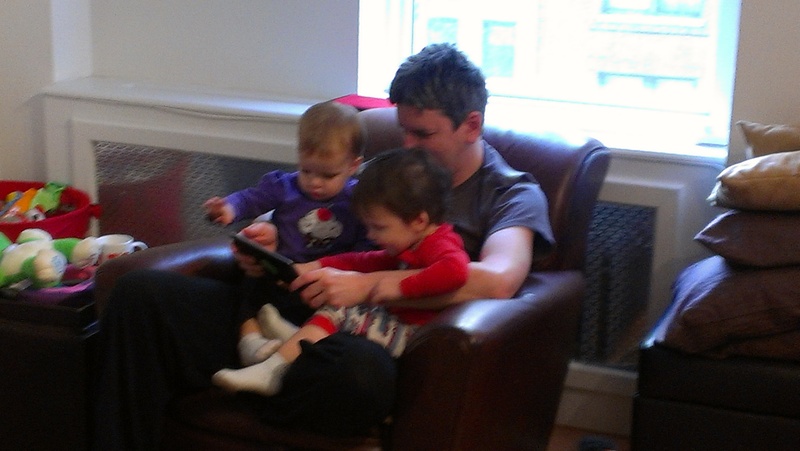 I think they still had fun though even if they did lousy. The winning score was a 28 out of a possible 40. After that game we moved on to opening presents. 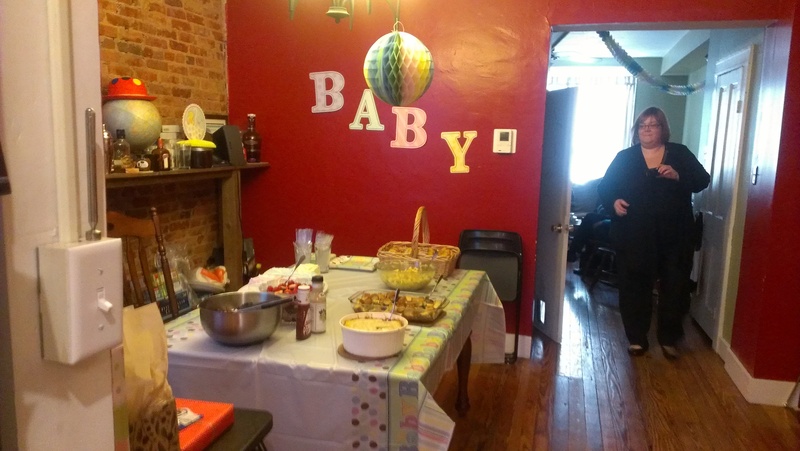 We played baby shower bingo during that. I handed out blank bingo cards to everyone. They had to write items they thought would be included in the presents in the blank squares and then they could mark their squares off if that item was opened. 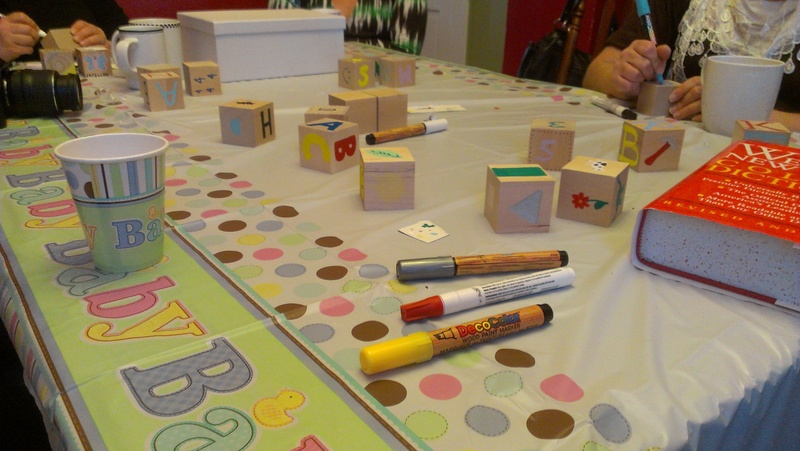 Our final activity of the shower was decorating wooden baby blocks. 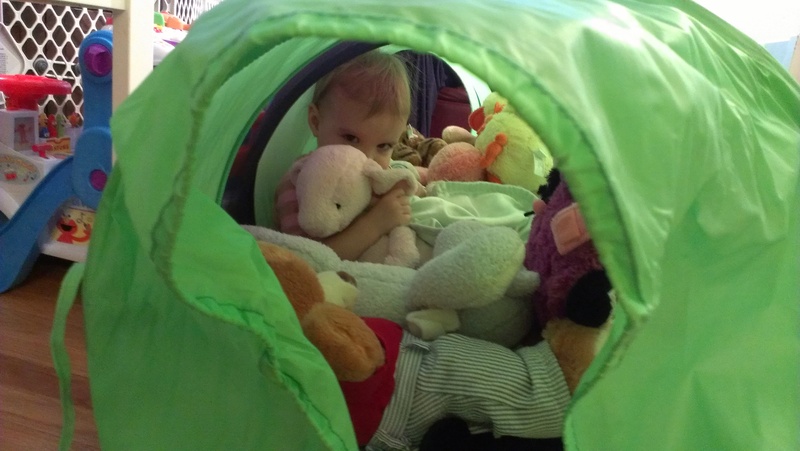 I have been to several showers in the past few years where we have decorated onesies, which is a cute idea but since it is done so often now I wanted to come up with something a little different. I ran across the idea of decorating blocks somewhere while looking for different baby shower ideas online and thought it was a great idea. I ordered the wooden blocks from this wood crafts site and bought markers that can be used for decorating wood at Michael’s and Joann Fabrics. And yes I am the nerd who broke out the dictionary because I was trying to make a U block since the baby’s last name begins with U and couldn’t think of enough things that began with the letter U. 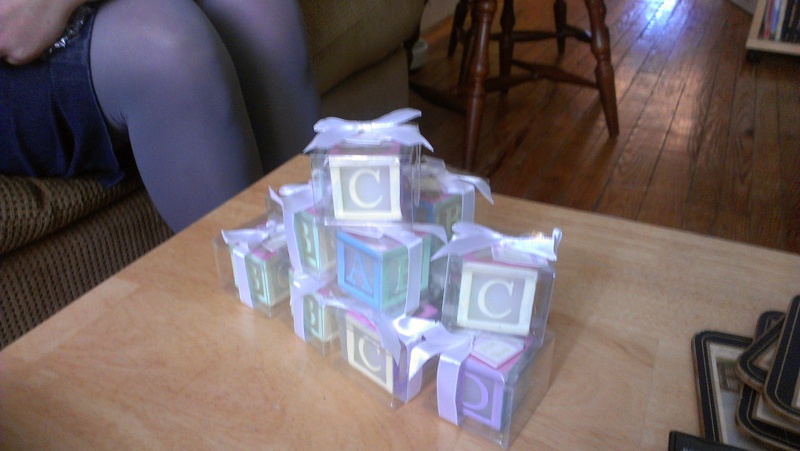 Our shower favors were also of course baby block themed. They were little candles shaped like baby blocks. All in all I think it turned out to be a great shower. Now for anyone who is interested in the actual making of the baby block cake. I made two 9 x 13 cakes and cut them into six approximately 4 inch squares. Then I stacked them to make 6 cubes. 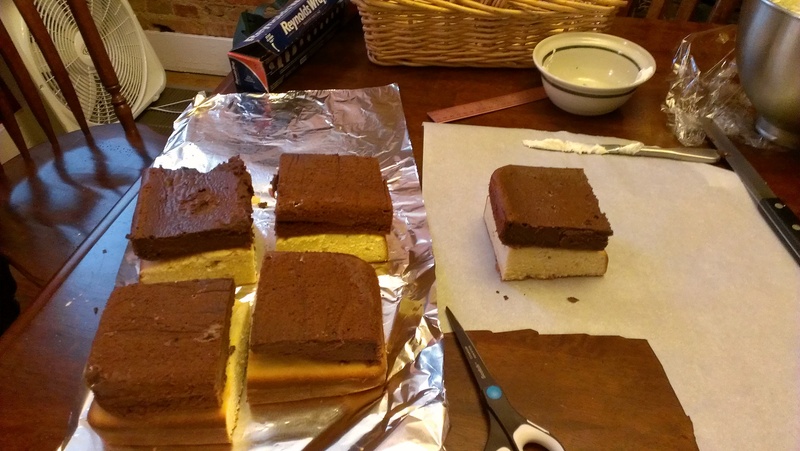 I thought I might need to cut off some of the cake to make them 4 inch squares, but with the shrinking of the actual cakes during baking I pretty much was just able to cut each cake into 6 equal squares, which worked out great. I made one chocolate cake and one yellow cake so that each cube had one chocolate layer and one yellow layer. I used this recipe for the chocolate cake and this recipe for the yellow cake. They were good recipes for this kind of cake because the cake was fairly dense and didn’t fall apart when cut, but just for regular cake eating purposes I’m not sure that I was very happy with either one and probably won’t use them again. Don’t get me wrong they were still tasty, but I have better cake recipes than either of these turned out to be. The buttercream frosting I used on the other hand was a keeper. I’m always trying out new buttercream recipes because I often find many recipes to be cloyingly sweet. I wound up using this recipe with a few tweaks. One I only put in about 1/3 teaspoon of almond extract because I find it to be a really strong flavor and 1 teaspoon seemed like a lot. I also did not include butternut extract because I have no idea what that is and wasn’t about to try and hunt it down. I figured the almond and vanilla extracts would suffice. The almond extract definitely gives it a slightly different flavor than the normal buttercream. I obviously wouldn’t use this frosting with a lot of cakes, but it worked really well in this case. I wound up making 2 and half batches of the frosting because there is a surprising amount of surface area that needs to be covered when making this cake. I put each block of cake on it’s own little sheet of parchment paper, which made it much easier to handle each individual cube. I started off frosting the cakes with a crumb layer, which I admit I’m usually pretty lazy about when frosting cakes, but it’s a must for this cake because of the cut sides. For anyone not familiar with a crumb layer, it’s a thin layer of frosting that you put on the cake which traps all the crumbs from the cake in it. You then put the cake in the refrigerator for about 20 minutes to let that frosting harden. Then you frost the cake for real. The crumb layer keeps all the cake crumbs trapped so that they don’t show. After frosting each cube I decorated them using a pastry bag and round icing tips. A small (number 5 I think) one to put the edges on the blocks, and a large (number 12 I think) to make the letters and numbers on top of the cake. The one thing I didn’t have, which I think would have made the cakes come out slightly better is a an offset spatula. As many cakes as I bake in a year it’s surprising I didn’t have one. I think using that rather than a butter knife would have made the frosting come out smoother, but oh well. I tried to find the night I made the cakes, but neither my local Target nor my grocery store had one in their baking sections. I’ve ordered one from Amazon, so I’ll be prepared for my next cake. Guys. I’m so excited about my new tights. I love fun tights as anyone who follows me on Twitter might have surmised from recent tweets of photos of my tights. I wanted to add to my collection since winter is here and tights weather has returned. 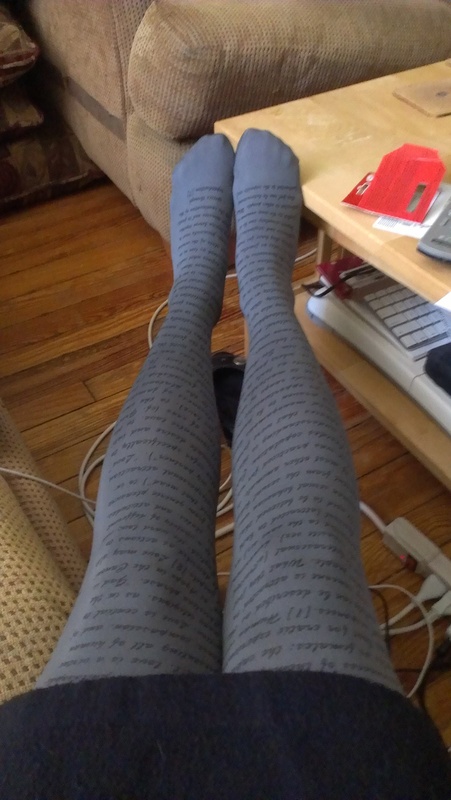 I got it into my head that I wanted some kind of literary tights that had writing on them. I mean I’m a librarian, why wouldn’t I want tights with script on them. It took me awhile to even find any tights like this. Then I kept coming across photos of these particular tights that people had posted various places on the internet but not somewhere I could order them myself. Never fear though, I prevailed and found somewhere I could buy them from…in Israel. Ok, honestly I didn’t realize I was ordering something from Israel until the package came today, but still. 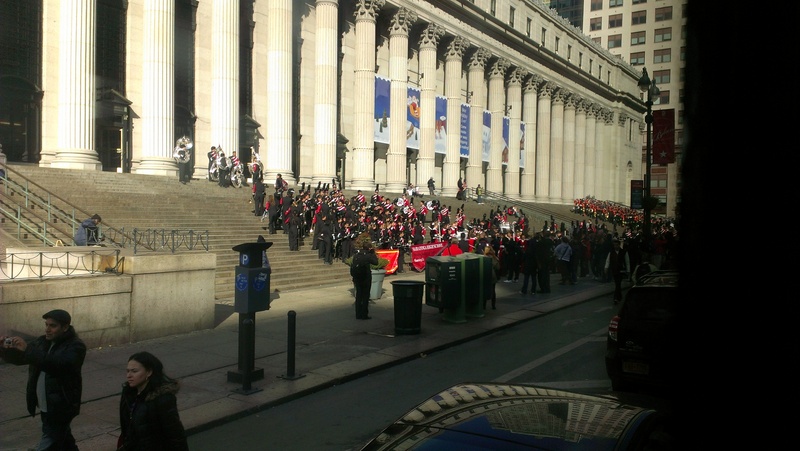 Their arrival was completely serendipitous as well. I was already planning on wearing a black skirt with a grey sweater today. Though I was planning on wearing my black and grey argyle patterned tights with the outfit. My husband answered the door for the delivery right as I was getting dressed after my shower. It was perfect. Also for anyone asking, I have no idea what the writing actually says or what it’s from. It is written in English, but it’s obviously hard to read. The label for the tights had something to do with love, so I’m guessing it’s a love poem of some sort.